A forefoot strike is our natural advantage for protecting the legs from injury during running. This is why running shoes for forefoot strikers need to mimic and compliment the anatomy of the human foot and they need to give you a natural feel of the earth. Vibram FiveFingers – Running in these shoes is a very liberating experience because they have no padding and are flat, which helps you feel your way through the ground, forcing you to land on your forefoot. Vivobarefoot – These shoes are zero-drop, durable, flexible, lightweight and are popular among ultra-marathoners. These shoe are known for having a wider toe-box than most running shoes, which helps your toes spread out. Most of these shoes are water-proof so they are great for all weather conditions. Xero Shoes – Highly adjustable, lightweight barefoot running sandals that come pre-laced for you. These sandals are specifically designed to match the contours of your feet and they are extremely flexible, so they mold nicely to your feet. Sockwa – These barefoot shoes are a great alternative to the Vibram FiveFingers, but their neoprene uppers makes them water-proof and warm enough for winter running. They are also constructed for all terrains from gravel to large rocks to wet, icy surfaces. Skora – These shoes are zero drop, but have more cushioning (removable insole) than most barefoot running shoes. The outsole lasts forever –which is why they are preferred for ultra-running. The upper of most these shoes are leather and seamless, so they mold and stretch to your foot, but the leather keeps your feet super warm, which is why they are preferred for running in cooler temperatures. Merrell Vapor Glove – These are zero drop running shoes that have a Vibram outsole and feel similar to the Vibram FiveFingers and the Xero Shoes as well. They have a wide toe box, and the overall construction is incredibly flexible where you can roll them up into a ball. The upper is also very thin, so they breathe really well in the summer. Tesla – These are virtually identical to the Merrell Vapor, they just cost less. 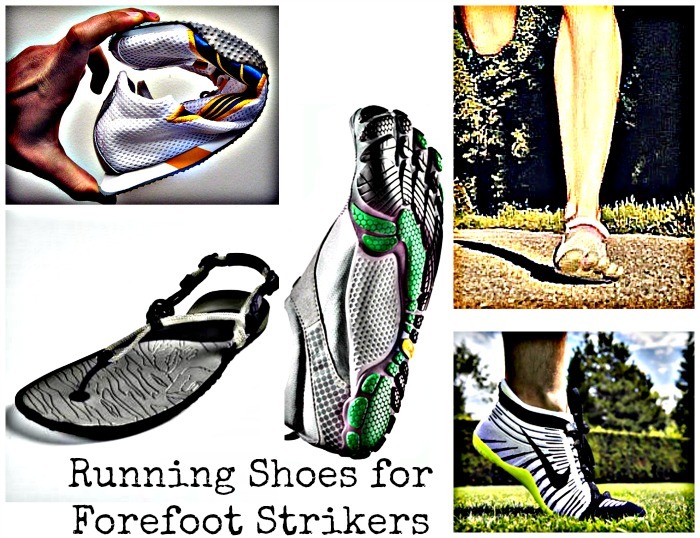 If you’ve enjoyed this article, you will love my YouTube channel where I provide more in-depth analysis on minimalist running shoes optimized for improving foot health and biomechanics! Xero Shoes also makes the Prio as an alternative to their sandals. The Prio is a great shoe, too. The sole material is amazingly supple yet extremely durable, and the toebox is wide enough to accommodate even my duck-like feet. And the uppers, while extremely well made, have given me no blisters, even though I wear them without socks or the thin insoles that come with the Prios. I love my Xero Shoes sandals, too, but the Prios are nice to have when the weather turns cold.